This walk: 2014-10-15. 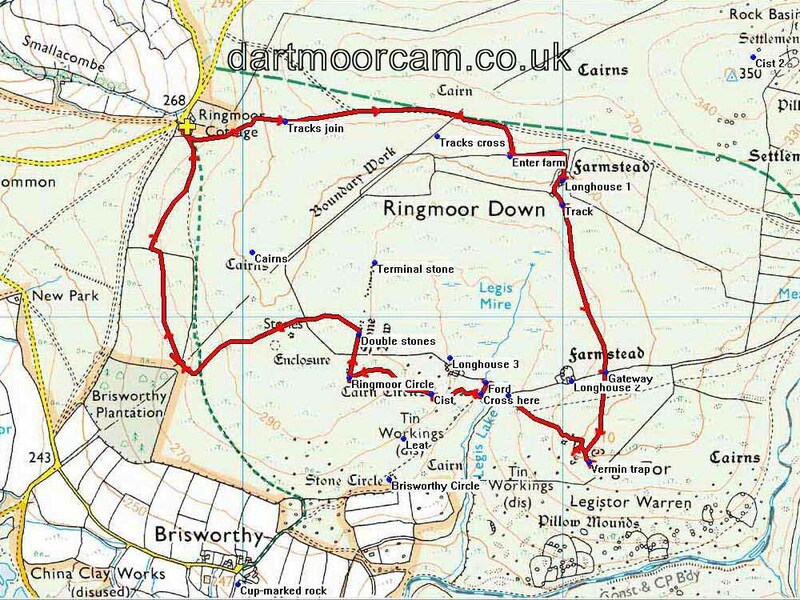 Ringmoor Cottage car park, longhouses, corn ditch wall, Legis Tor, vermin trap, Legis Lake ford and stepping stones, cist, Ringmoor Down circle and stone row. Previous walk in this area: 22 Feb. 2012. Many photos taken during a 'recce' on a misty day on 29 Sept. 2014 and the "people" photos were taken in heavy rain on the walk. Photograph taken from inside one of the longhouses, in heavy rain. A landmark cattle lick encountered along the track. Downland Mag Extra livestock dietary supplement for cattle. There's a gateway ahead, at SX 57135 65825. Second longhouse site at the farmstead at SX 57030 65799, with Legis Tor behind. Legis Tor, SX 57110 65578, elevation 310 metres / 1017 ft.
View inside the trap - as it was raining heavily, I decided against doing any "gardening" to improve the photograph. The stepping stones - not so good, 30 metres downstream (SX 56747 65758) is much narrower. Seen on the "recce" but not visited in the rain - Brisworthy stone circle (restored): J. Butler (1994), Dartmoor Atlas of Antiquities III, The South West. 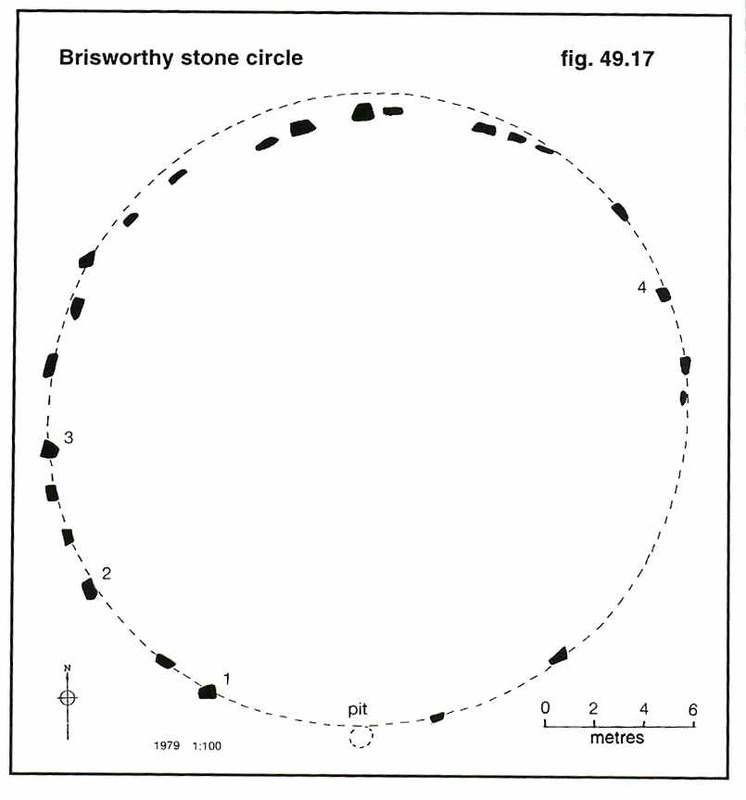 49.8 Brisworthy stone circle (fig. 49.17), pages 133-134. With only four stones standing, the circle was restored by Breton and members of the Barrow Committee in 1909. Butler suggests about fifteen stones are still missing. Image © J Butler 1994. Reproduced by kind permission (ref. 29 Sept. 2012). Overview of circles, cairns and stone row on Ringmoor Down, also of medieval enclosing banks and ridge and furrow area from ploughing. 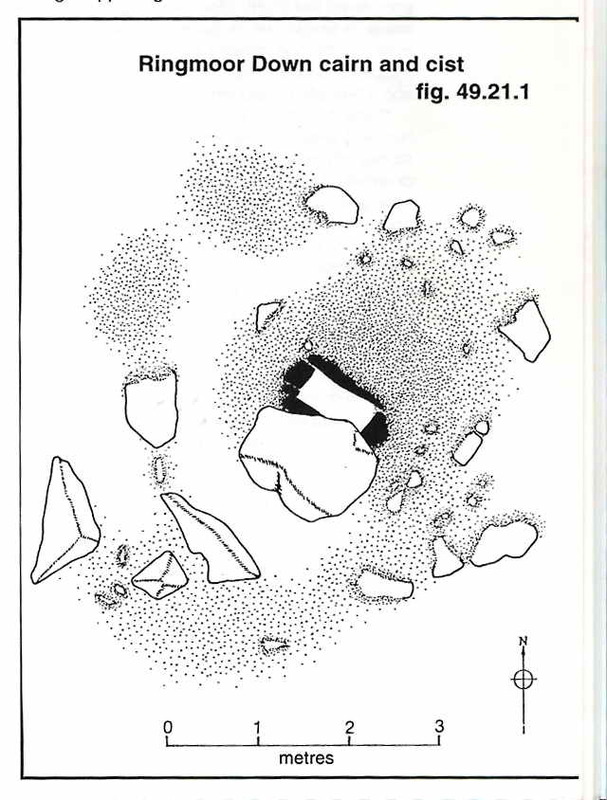 Source: J. Butler (1994), Dartmoor Atlas of Antiquities III, The South West. 49.21 Ringmoor Down West cairns (figs. 49.21, 21.1), pages 144-145. Notes: (1) the farmstead at top right (SX 57000 66428) is the one visited on the walk and (2) the cist visited (see below) is marked as "2" on the figure above. Believed leat, SX 56504 65620. As previous photograph, with Legis Tor behind. J. Butler (1994), Dartmoor Atlas of Antiquities III, The South West. 49.21 Ringmoor Down West cairns (figs. 49.21, 21.1), pages 144-145. See, we were here - and still smiling! 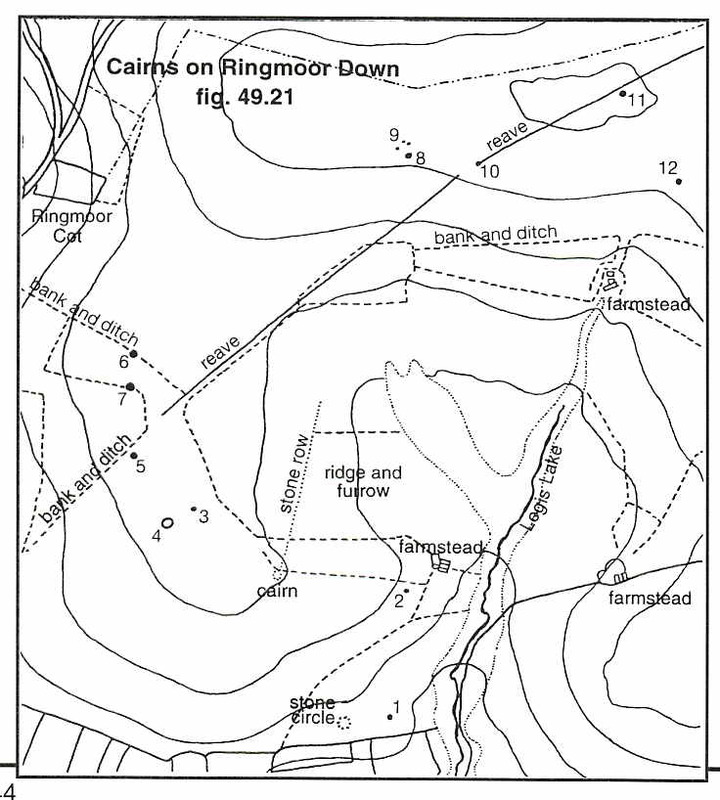 Ringmoor Down stone circle and row: J. Butler (1994), Dartmoor Atlas of Antiquities III, The South West. 49.20 Ringmoor Down stone row (figs. 49.20, 20.1), pages 142-143. 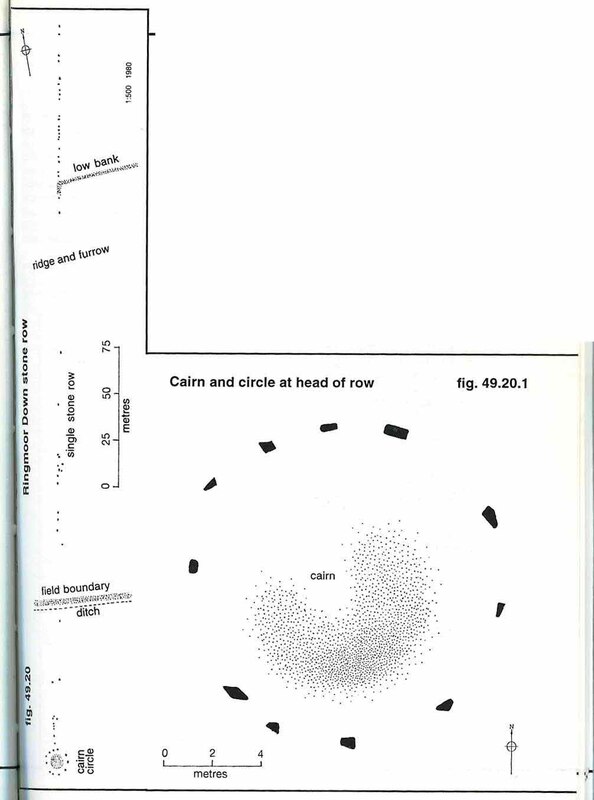 The circle is at the end of the row at the bottom left of the figure. The stone row goes off towards the top right of the photograph ......another restoration, believed by Baring-Gould in 1909, originally about 200 stones, 369 metres long, some of this may have been added in error in the restoration. Evidence that the row was once a double row? The present-day end of the row of standing stones. Cairn at SX 56030 66203. Red = GPS satellite track of the walk. © Crown copyright and database rights 2014. Ordnance Survey Licence number 100047373. Use of this data is subject to terms and conditions. NB - The route taken after the "Double stones" was not that intended as in the heavy rain I did not look a lot at the GPS or compass - we were supposed to head uphill to the cairns (as we started to do) but we were diverted and reached the corner of Brisworthy Plantation instead of Ringmoor Cottage. This walk can be reached by going from Dousland down past the Burrator Dam turn-off towards Meavy. Pass two right turns, each going into Meavy and continue straight on. Pass a right turn (to "Lovaton") and take the first LEFT turn to "Sheepstor". The car park is nearly 1 km along on the right, a small quarry just before the cattle grid and clump of trees. Distance - 5.26 km / 3.25 miles.